Nanimarquina is marking thirty years of creating unique carpets and they are releasing several new rug collections to celebrate. Driven by a singular desire, Nani established Nanimarquina in 1987 with a clear goal: to design unique and surprising handcrafted rugs for people to enjoy. The idea of blending contemporary design to traditional rugs was well received and soon Nanimarquina embarked on the adventure of outsourcing production to those countries that offered cultural value and unlimited possibilities for rug craftsmanship. The perfect gift for a 30-year milestone, the Nanimarquina Hayon x Nani is a dreamy, wild collection with a great sense of humor. A first glance reveals a chaotic tangle of colors and shapes that invade the rug. However, after looking carefully, the imagination of Jaime Hayón springs to life: turtles, lips, hands, stools, fish, half men – half birds. Created using the hand tufting technique, the definitive and faithful reproduction of the original sketch by the designer is achieved. 100% New Zealand wool, many size options available. Nanimarquina is a family-owned company, and a pioneer in the field of contemporary rug design. They are always searching for innovation, handcrafted techniques, and new materials. They are invested in conveying the essence of their brand, highlighting their values to produce quality rugs that blend traditional techniques and modern design. When creating the Shade Collection, designer Begüm Cana Özgür emphasized: "this is a handmade flat-weave rug that generates an incredible and well-rounded diffusion of color. 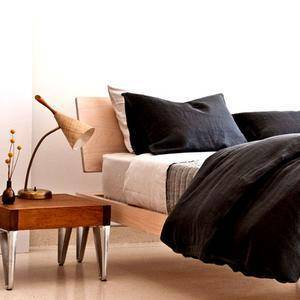 The surface releases a sense of tranquillity and well-being that is balanced by the penetrating vibration of colors." Shade is available in three ombré palettes: from turquoise to eggplant, russet to Klein blue, and raspberry to forest green. Working with local and international designers Nanimarquina ensures a diversity of themes and experimentation with various textures, materials and shapes. The result: one-of-a-kind Nanimarquina rugs for each customer. A rug for each individual space and emotion. Inspired by feathers, the Quill Collection is drawn by hand, each design is organic and subtle. Quill expresses the understanding of the beauty that lies in the modest, rustic and imperfect. “Like Nature where no two shapes are alike, each Quill rug has its own expression, like a living creature.” - designer Nao Tamura. Global thinking. This is one of Nanimarquina’s values — being aware of others and trying to do their bit to improve the lives of people who live in the areas where the rugs are produced. Nanimarquina relocated all their production to these areas of the world allowing them to boost local economies in these countries and offer new opportunities and improved living standards for the local people. A slim, hand-woven Kilim, the Blend Rug Collection applies the basic rules of color theory, with three available models in which hue, luminosity, and saturation vary. This original rug from Pakistan will delight those passionate about color. Made of 100% Hand Spun Afghan Wool. An artisanal flat-weave, made in India, the Mía Rug Collection is a Dhurrie created by joining three pieces, individually dyed, to obtain a worn, lived-in effect. Made of 100% New Zealand Wool and available in four color options. Caring for the environment is a key preoccupation at Nanimarquina. Under the international premise of “reuse, reduce, recycle”, they pay the utmost attention in caring for and preserving the environment that surrounds them. Using biodegradable and recycled products, experimenting with different types of textures and fibers and using traditional production techniques all contribute towards preserving natural resources for the use and enjoyment of future generations. The Tres Collection reflects Nanimarquina’s passion for craftsmanship, specifically paying tribute to the ancient craft of weaving. Tres is a traditional Indian flat-weave Dhurrie rug. Its unique quality lies in the production of three independent parts in which different fibers predominate. The Jie Collection was designed by Neri & Hu, who take inspiration from the tile patterns of Shanghai streets, a place where life literally happens. The name of the collection corresponds to Jie, the Chinese character that embodies the essence of a city: the constant movement, dynamism and frenetic activity. The result is an eclectic hand-tufted rug presenting different pile heights and finishes. Why do you need a rug? Because “a carpet is the soul of the apartment” says Edgar A. Poe. Rugs define spaces, frame ambiences and establish interfaces while conveying a sensation of warmth that creates a welcoming work or home environment. Beyond the impression created by their beauty, colors, textures and design, rugs also affect mood. Architects and interior designers consider rugs an essential part of a room’s decoration. Rugs and ceramics have been a companion for human beings from prehistory to today. A rug is a house in the desert. This entry was posted in Uncategorized, Design & Decorating, Accents & Accessories, Fabrics & Textiles, Green & Eco-Friendly, New Products, Carpets and rugs and tagged nanimarquina, Rugs, Carpets, Nanimarquina Hayon x Nani, Nanimarquina Shade, Nanimarquina Quill, Nanimarquina Blend, Nanimarquina Mia, Nanimarquina Tres, Nanimarquina Jie on June 12, 2017 by Christine Toller. Last week marked the 100th birthday of Florence Knoll whose signature style and pioneering spirit are at the core of everything Knoll. Her influence on the "total design" sensibility of Knoll cannot be overstated. Florence broadened the company’s existing array of furniture offerings, developed the Knoll Planning Unit, an interior design division of the company that set the standard for the mid-century modern interior, and in 1947 she launched a textile program to fill another gap she perceived in the market for furniture upholstery. This would later become KnollTextiles. Florence Knoll's early life was marred by tragedy when she was orphaned at age 12. 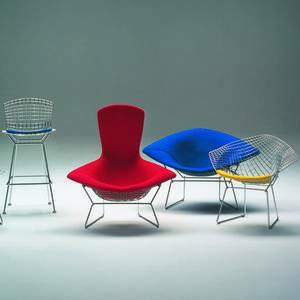 After boarding school Florence enrolled at the Cranbrook Academy of Art where she met Harry Bertoia, who would also collaborate with Knoll on modern furniture designs. During her formative years studying architecture in Chicago, Florence met many of the leading architects of the time, including Alvar Aalto, Marcel Breuer, Walter Gropius and Mies van der Rohe. In 1941 she met Hans Knoll who was the third generation of a Stuttgart-based furniture manufacturing family, who sought to bring European Modernism to a new audience in the United States. They married in 1946 and renamed the company Knoll Associates. With a spare, geometric profile—an expression of the rational design approach Florence Knoll learned from her mentor, Mies van der Rohe—the Relaxed Lounge Sofa is utterly modern and totally timeless. Compared to the standard Florence Knoll Lounge Collection, the Relaxed Edition offers a softer version, with deeper proportions for a more relaxed sit. In 1945 Florence Knoll started The Planning Unit, an interior design division of the furniture company that set the standard for the mid-century modern interior. Florence Knoll’s meticulous methods of assessing a client’s needs were clear in her sketches, annotations, and especially the "paste-up" cardboard models she used to demonstrate envisioned spaces. Finding the marketing lacking, Florence Knoll also designed individual pieces of furniture. "I needed a piece of furniture, it was not there, so I designed it." - Florence Knoll. The Florence Knoll Executive Desk exudes executive quality and epitomizes Mies van der Rohe’s impact on Florence’s approach to design. Each detail was endlessly refined to achieve simple, seemingly effortless beauty. Available in six table top finishes. Florence Knoll's Credenza Collection is perfectly proportioned and immaculately detailed. The iconic Florence Knoll Credenza works as well in the dining room as it does in the office. In 1947, Florence Knoll launched a textile program to fill another gap she perceived in the market for furniture upholstery. This would later become KnollTextiles. "It became apparent to me that suitable textiles were not available for our furniture and interiors," she wrote. Florence's use of small fabric swatches—the simple but effective practice of stapling fabric samples to pieces of cardboard—in client presentations led her to develop a tagged sample and display system that eventually became an industry standard. In the early 1950s, under Florence Knoll's stewardship, the company developed a distinctive graphic identity, collaborating with Swiss photographer and graphic designer Herbert Matter to design everything from advertisements and stationery to the company’s distinctive logo. But in 1955, her life was struck by a second tragedy when Hans Knoll was killed in an automobile accident and she suddenly found herself as Knoll’s sole owner. In 1957 she married again and continued in her capacity as Knoll's president and later as its director of design, but eventually sold the company to Art Metal Construction Company in 1959. Even after her departure from Knoll, the company continued to be inspired by her synthetic view of design and rigorous standards. To celebrate a century of Florence Knoll and her inspired brand of modernism, Knoll expanded the Florence Knoll Collection with the addition of new and archival products. Revived from the Knoll product archive 70 years after its initial introduction, Florence Knoll’s Model 75 Stool is now available as the Knoll Hairpin Stacking Table. The early design was based on her wire studies done while a student at the Cranbrook Academy of Art, which were eventually translated into the immensely popular design for Knoll. In 2002, Florence Knoll Bassett was awarded the National Medal of the Arts, the highest honor for achievement in the field presented annually by the President of the United States. In the lasting acclaim for the planning projects she spearheaded and the pieces of furniture she quietly designed, Florence Knoll has continually proven her own mantra—that "good design is good business." This entry was posted in Uncategorized, Seating & Chairs, People & Bios, Design & Decorating, Accents & Accessories, Living & Rec Room, Fabrics & Textiles, Office & Workspace, Lists & Best Of, Awards & Recognition, Classics and tagged Knoll, florence knoll, Florence Knoll Credenza, Herbert Matter, Knoll Relaxed Lounge Sofa, Florence Knoll Executive Desk, Knoll Hairpin Stacking Table on June 1, 2017 by Christine Toller.